of an exclusive and strictly limited anniversary edition. The exclusive anniversary models are made in excellent gunsmith quality with love and care for details and first class precision. The first of July is the foundation date of the ANSCHÜTZ company and will be the date for presenting our first anniversary model. The following models will be presented every month until IWA Show 2017. 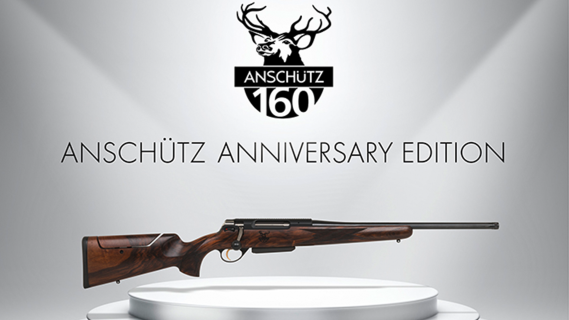 Ever since their foundation 160 years ago, ANSCHÜTZ stands for innovation and perfection. The ANSCHÜTZ family stand for this with their name. The strictly limited anniversary edition is put together with 8 different models of 20 units each. The model 1771 DIAMOND - caliber .222 Rem. The 1771 barrelled action was specially developed for hunting varmints, predators, and light game. In contrast to many other rifles which feature larger and heavier actions in these small centerfire calibers, the 1771 barreled action components are slightly scaled down and specifically designed for this small centerfire caliber group. The barrelled action is highly impressive with its smooth bolt movement, outstanding precision, and attention to detail. 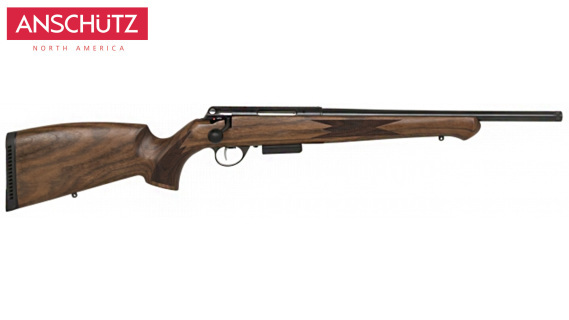 The excellent feel and accuracy makes it perfect for both hunting and target shooting. Once you shoot the 1771, you will understand why this model is enjoyed by an ever increasing number of hunters and target shooters all over the world. non-slip checkering an the pistol grip and forend with borders, heartwood wood class 4.
for attaching a sound moderator or a muzzle brake. • Specially decorated bolt knob. • DLC coated receiver for excellent corrosion resistance. • Perfectly tuned single-stage trigger 5097/2D, set to 500 g, with an adjustment range of 450 g – 750 g.
• Custom machined black anodised aluminum magazine base with anniversary logo and an additional spare magazine. aggressive substances such as acids, bases (hand perspiration) and solvents. This trim rifle is perfectly balanced and feels quite at home when shooting from the prone or standing position, even running shots on moving game, as well as on the bench. 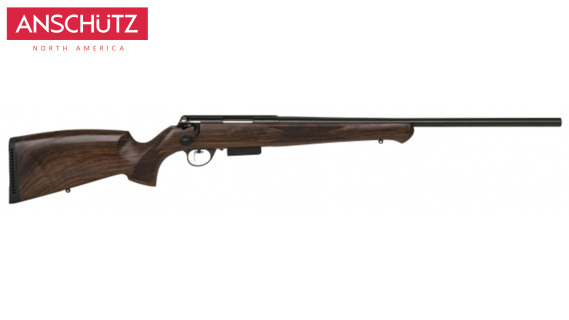 It is designed for highly precise shots, a familiar environment to our ANSCHÜTZ target rifles. 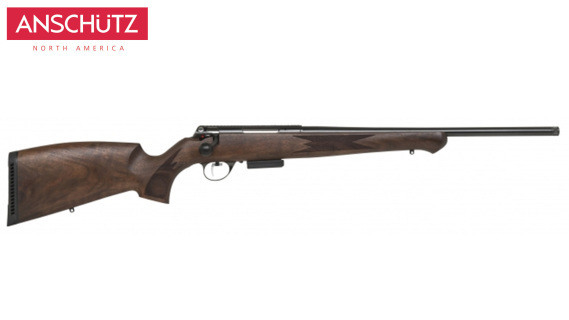 Once you shoot one, you will start to understand why the ANSCHÜTZ hunting repeaters are enjoying ever increasing popularity with hunters and shooters all over the world. • Extremely smooth and pleasant action. • Trigger isGerman gunsmith's art. Barrel Length: 18" heavy barrel, no iron sight provision. 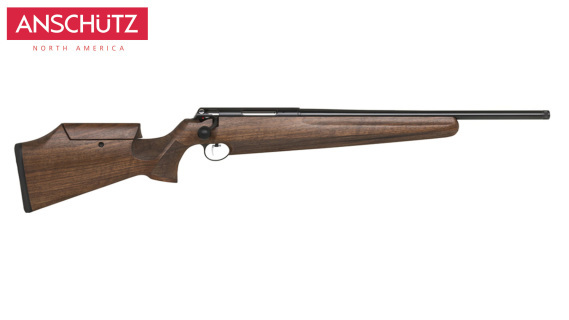 System: 1771 bolt action with single-shot feed block, six front locking lugs, blued finish. Weight: 7 lbs, 12 oz. Barrel Length: 20.1" heavy barrel, no iron sight provision, threaded M15 x 1. Stock Style: Germany styled walnut with adjustable cheek piece. The 1781 HUNTER model - caliber .308 Win. the countless demands encountered in the field. As is usual with all ANSCHÜTZ rifles, the Model 1781 impresses with precision and an outstanding two-stage trigger. The 1781 anniversary model is equipped with a fluted barrel and muzzle threading. The M15x1 thread enables problem-free, accurate fitting of a sound moderator or a muzzle flash suppressor. The fluting on the barrel increases the surface area and thus dissipates heat during shooting quickly and efficiently. Consequently the problems caused by heat, in particular the mirage above the barrel, is reduced thus improving sight picture. anniversary logo, and fully adjustable cheek piece. for attaching a sound moderator or a muzzle flash suppressor. laser-engraved ANSCHÜTZ lettering, as well as an additional spare magazine. • Specially decorated steel bolt knob. of 700 – 1.300 g with distinctive gold-plated trigger blade. With the adjustable cheek piece on the 1781 HUNTER anniversary model, the hunter can adapt the cheek height to his individual requirements. In some ways a factory-standard stock is always a compromise, as during the development and dimensioning of the stock the attempt is made to reach the greatest possible spectrum of hunters. But since every person has his own body mass and expectations of a stock, and uses individual sight sets, optimum adaptation of the stock to the hunter is important. This is possible by means of either expensive stock customising or a stock that is adjustable to individual requirements. is collectable 1781 rifle chambered in .308 Winchester is a very rare offering from our centerfire line of rifles. Featuring a 18” blued fluted barrel with a matte black anodized finish on the receiver, this barrel is also threaded 15x1 metric at the muzzle. The classic walnut stock feature an adjustable cheek piece. Two stage trigger set at 2.2Lbs (1,000 g). Includes test target, two 3-round magazines with Anschutz aluminum base plates and 160th Anniversary booklet. Only 20 produced worldwide with only 4 being imported into the United States. System: 1781 bolt action repeater, six front locking lugs, black anodized finish.